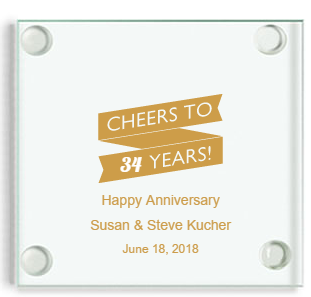 Custom printed anniversary coasters are created in the design of your choice to match the personalities or style of the special couple you are celebrating! 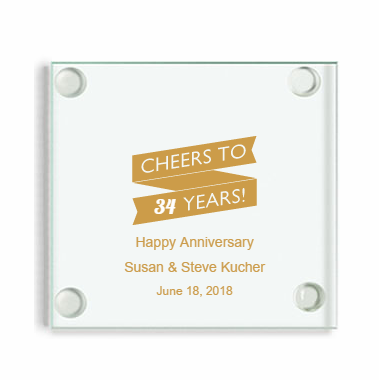 Each square glass coaster measures 3.5 inches and has rubber feet so it won't slip. Your design is carefully silkscreened directly on to the glass. Coasters are not in individual boxes; they come bulk packed. Most customers put one at each place setting or display them on a table for each guest to take. You can order white gift boxes for $.50 each. They will come flat and you can assemble the box to insert your coaster favor and finish the presentation with a lovely white peel and stick bow.